One of the manufacturing sector’s biggest open secrets is that companies are in serious need of workers. The workforce shortage crisis has been looming for years, and it is only set to deepen due to a combination of continued business growth, unprecedented retirement rates, employee turnover, and significant investments in new technology. However, a new study released by Catalyst Connection – an Industrial Resource Center in southwestern Pennsylvania that has been helping regional manufacturers grow their businesses for more than 28 years – shows just how real that need for qualified employees has become. The Making Your Future Manufacturing Employment Demand Study, funded by the Richard King Mellon Foundation, was conducted from May through June, 2018. Key goals were to determine if there was an increased need for: investments in workforce development, improvements in immediate employability skills, change in perceptions of manufacturing careers, and improved employer practices to attract and retain a skilled and qualified workforce. Manufacturers are demanding more workers. The study, which featured responses from more than 111 manufacturers in southwestern Pennsylvania, found that while respondents remain committed to the region, they are experiencing higher costs due to the skilled worker shortage. Almost all respondents have current open positions, with approximately one third of those being entry level. Of the open positions in technical production, machine operators were the most needed. Respondents also noted that the top skill deficiencies in applicants were basic employability skills, basic technical degrees, and basic mechanical skills. Eighty-one percent of respondents ranked basic employability skills (attendance, timeliness, and work ethic) as the most critical of these skills deficiencies. The surveyed companies cited a lack of applicants (qualified or otherwise) and drug screening as the top root causes for the unfilled entry level positions. They pointed to three performance measures being impacted most by these unfilled positions: on-time delivery, production costs, and sales growth. Ninety-two percent of respondents say that the skilled worker shortage is having some impact on their business, while sixty percent say that impact is significant or critical. Moreover, though sales growth is happening in most companies, only two thirds are seeing employment growth or profitability growth. The top three most likely business impacts of the skilled worker shortage, according to respondents, include the need to invest in overtime pay, loss of growth and profitability, and cost of quality, while loss of customers and outsourcing come in close behind. screening 5-10 applicants, and almost a quarter screening more than 20 before hiring. Community stakeholders should increase their investment in workforce development efforts and expand apprenticeships, internships, and community college offerings for high-skilled, high-wage metals jobs (particularly for unemployed, underemployed, and disadvantaged populations). Job seekers should pursue improvements in their basic employability skills, basic mechanical skills, and other related technical training. They can take a self-assessment to discover careers that match their skills, interests, or values, then participate in training or Apprenticeship programs to “earn and learn” while gaining valuable on-the-job experience and recognized credentials. Maker spaces are another excellent way to accrue much-needed skills in a pressure-free community setting. Employers should pursue best practices in human resources, company culture and employee engagement to reduce voluntary turnover and the costs associated with a lack of workers, such as overtime, poor quality, and poor on-time delivery. They should also look to host an apprenticeship, post their available positions in places where potential applicants are more likely to find them, and train managers to help nurture and develop new talent. Training providers should seek to expand their employer engagement to better connect employers to students, creating opportunities for collaboration among companies in similar sectors to build curricula and address gaps. They should also incorporate core competencies into all relevant curricula, including, but not limited to: work-ready behavioral skills, digital skills, and the ability to continue to learn and develop. The full study is available for download at Catalyst Connection’s website: https://www.catalystconnection.org/. Ms. Petra Mitchell is the President and CEO of Catalyst Connection, a private, nonprofit economic development organization dedicated to helping manufacturers with management consulting and technical assistance leading to business growth and job creation. Catalyst Connection is the NIST Manufacturing Extension Partnership (MEP) and the Industrial Resource Center (IRC) of Southwestern Pennsylvania and Ms. Mitchell is its Center Director. Ms. Mitchell’s experience in manufacturing operations, technology acceleration, and business development stretches back to 1988. Before joining Catalyst Connection, she was employed by GE Aircraft Engines, now GE Aviation. She holds a B.S. in mechanical engineering from the University of Dayton, and an M.S. from the University of Cincinnati. Ms. Mitchell was named a 2011 Top Women in Business Leader, a 2012 Top Energy Leader and a 2016 Most Admired CEOs in Pittsburgh by the Pittsburgh Business Times. She is on the Board of Directors of the Advanced Robotics in Manufacturing (ARM) Institute, Leadership Pittsburgh and Pennsylvania Industrial Resource Center (IRC) Network. 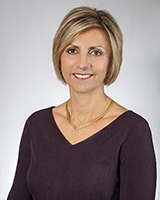 She is a former member of the Board of Pittsburgh Branch of the Federal Reserve Bank of Cleveland and Keystone Powdered Metals, and is also the Honorary Consul for the Republic of Slovenia.